Note: This recipe was originally posted in April, 2010. We still make these and they’re still just as delicious. You won’t regret giving this recipe a try! I’ve probably made these cheese crisps 100 times already. They’re so delicious, easy to “customize,” and quick to make. They’re great to snack on when you’re in the mood to “munch” but carrot sticks just aren’t cutting it – these are full of protein and fat and (depending on your cheese) zero to few carbs. They’ll satisfy actual hunger, which is always a plus, you know, for FOOD. So, start with your cheese. You can use cheddar, parmesan, Monterey jack, whatever you’d like. I haven’t tried it with mozzarella or provolone yet so I’m not sure how those would turn out, but if you’re in the mood for that, why not give it a try? What’s the worst that could happen? If you’re planning on mixing in seasonings or spices, grate your cheese. Or get pre-shredded cheese. Either is fine. I’ve used the “mexican shredded blend” before with success. Did you hear me about the parchment? It must be parchment. Foil won’t work (trust me, I’ve tried), nor will “cooking spray” or any other method… parchment and parchment only. Can I say it again? Parchment. Now, if you’re using shredded cheese + seasonings, go ahead and toss it all together in a bowl. Cheddar/Jack and Ranch dressing mix is amazing. “Mexican blend” is great with some chili powder and garlic. Parmesan and basil is always nice. Do what feels good to you. Just don’t add salt. Remember, cheese is already PLENTY salty on its own. You do NOT need additional salt. After a few minutes, they’ll be crisp! And you have a great party snack. Or a lunchbox “side.” Or if you’re like me, possibly dinner. 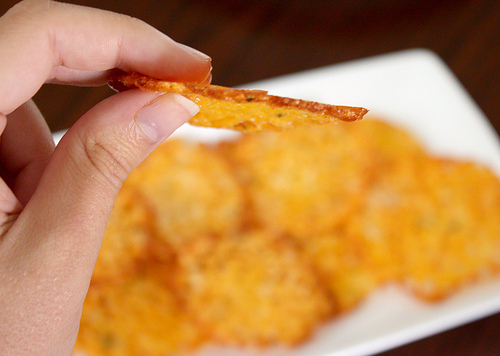 Make awesome crunchy cheese crisps with just a few ingredients (or just one) and a few minutes. A low-carb snack that is satisfying and healthy. Line a baking sheet with parchment paper. Not waxed paper. Not foil. PARCHMENT. Trust me. Either put little lumps of the shredded cheese (maybe 1 Tbsp or so) or squares of the sandwich slices (about 1/4 or 1/6 of a full slice per cheese crisp) onto the parchment, a couple of inches apart. They will spread as they bake. Bake 5-7 minutes or until beginning to brown around the edges. Allow to cool, to finish getting crispy. Eat! They're great plain or with your favorite dips. Check out my really delicious artichoke dip. I used baked cheese crisps as my “crackers” to scoop it up and it was to die for! These are great. I actually like to bake mine until they are mostly browned, but not burnt. They are great with some chopped cilantro, or chopped jalapeno’s. They help me take care of my chips and salsa craving without breaking my carb count. How would you suggest I bake 2 pans at a time? Dr says i need to cut out carbs and i am so happy i dound these cheese chips! They take away the cravings for chips. I make em on silpat silicone pad. Works terrifico. I made these today with Monterey Jack & a hint of garlic powder. Mine took around 10-12 min at 350. Definitely parchment paper is a must. They peel right off. I put them in a stack of ten. Wrapped in Saran Wrap & then placed in a ziplock. Going to see how they do in the freezer. Thanks for the recipe. They are super easy & delicious! I made these with Monterey Jack & a hint of Garlic powder. Turned out just like the pictures posted. You must use parchment paper. They peel right off. Mine took 10-12 min @ 350in my oven. They are delicious! I took about 10 & wrapped them in Saran Wrap & then placed in a ziplock. I put them in the freezer. Will see how well they do. How do you store them? In the fridge or cabinet in a bag? I love making making these! How do you store them and for how long? Did a mix of Colby Jack and Italian cheese, as well as Italian seasoning….SO GOOD!! Do people store these in the fridge or at room temp in a container? I made my cheese chips with cubed mild cheddar but I added a twist. I just placed the cubes on the parchment paper not too close together and literally balanced a thin round of pepperoni on each cube. I baked them at 420 for 10 min and WOW! So good! Thanks for the recipe!! I added Italian style breadcrumbs to my mixture for the extra crunch, and they turned out almost like crackers! So good!! hahahahaha Ciara. That’s me, the fancy chef guy. Nope… just parchment is amazing is all. Gosh these are amazing, really. I tried colby jack cheese and they taste exactly like Cheeze-Its! My mom adores them. Only thing is when I account for spacing in the baking pan, I end up only putting on six piles of cheese at a time. How do you all make them in larger batches? Since writing this, I’ve changed to using thin-sliced cheese either pre-packaged or from the deli. Cut each piece of cheese into 6 or 8 little squares, and they don’t spread as much as the piles (but they do still spread)… you can fit more onto a sheet that way. But usually I have 2 cookie sheets going at once, and do like 3 batches of them. can u use crumbled goat or crumbled feta mixed with parmesan? How much fat do you estimate this process looses from say cheddar cheese for example. I’m trying to figure out how to determine how many grams of fat these have. I tried the microwave cheese snacks, but they didn’t cook as evenly as these. I just made Pepper Jack and Medium Cheddar and they are delicious! I want to try Mozarella with a little piece of tomato in the middle and see how that turns out. I’m doing low-carb hoping to cure my GERD, so these will be a daily snack, I believe. I think the pepper jack would be great with pepperoni slices. I am making these now to take on vacation to the beach where evenings are spent on the balcony watching the sunset, munching and drinking wine. These. Are. Magnificent. Not as fabulous was a recipe with almond meal and cheese…and in addition, thought that I’d be adventuresome and try the Kraft American cheese slices with jalapeno. UGH. Will keep it easy and continue with this recipe, thanks so much for posting. I use to make these using slices of block cheese. Id make it for my kids when they came home from school usually with some fruit or occasionally pieces of chocolate. We would talk about their day at school then do homework. But I didn’t use the oven I would make them in a large Teflon 0an and used tooth picks to pick up the crispy parts. I kind of want to grind some up and use as a salt substitute? For example, use in Italian sauces if you make the parmesan one, or add sriracha and use it in Mexican recipes just for starters. I can think of more uses, toppings for salads, popcorn, savory muffin toppings, mix in salad dressings…just about anything! What do you think? 350 degrees for 11 minutes (turning pan twice). Perfecto …. thanks for a great recipe. I had been missing crunch …..
so glad you loved them! 🙂 Don’t forget about pork rinds for crunch. pickles are good too! can you use crumbled feta or crumbled goat added to the parmesan? Oh.My.Holy.Deliciousness. So, I had just come home from the grocery store discouraged because I could not find “it’s just the cheese” crisps (once again) that someone was passing out as samples months ago. well I googled them and here was your recipe that popped up. I didn’t have parchment paper and didn’t want to go back to the grocery store… but I did have a well seasoned “bacon only” cookie sheet. ( I’ll never fry bacon again). just so happens we had bacon this morning so it was freshly seasoned and added some shredded sharp cheddar and baked. SO GOOD! Needless to say, my “bacon only” cookie sheet is now my “bacon and cheese crisp only” sheet. They slid right off. THANK YOU SO MUCH! I’m so so glad you found my recipe and you’re enjoying them! Well, for bacon, a cookie sheet. But I’ve tried using wire cooling rack (putting bacon on it then baking). Can’t seem to get it crispy. For the cheddar cheese crisps I’m just using a cookie sheet with parchment paper. Kelli – For crispy oven bacon, maybe try lowering the heat a bit & then just keep cooking it longer until it’s very brown & melt-in-your-mouth crispy. It’ll eventually get there. I made these for a ladies weekend earlier this summer. I used just Colby cheese for one batch and then mozzarella topped with a jalapeño for another batch. One of the ladies hid some of the Colby snacks to make a grilled cheese sandwich with and said this is how she makes them now. These are now requested at every gathering. My family loves them, too. They couldn’t be easier to make! Thanks for sharing. Hi, I have made these for several years, but instead of parchment paper, I use an old corning ware pan. I spray briefly with pam, add pieces of cheese, nuke for 5 to 6 mins. When I remive the dish I set it on heat proof surface cause it is HOT. I use paper towels to soak up the grease in the dish. I also dab the cheese pieces too to remove excess oil. When u see how much oil comes off the cheese, you will feel even better about eating them as the are almost pure protein snack. Great for low carb diets. My only question is to how to calculate how many calories they have after this process. But they R yummy. Look up food value of cheese!! Love this recipe! Can’t wait to try them. Can anyone tell me if you can use pre-grated parmesan cheese. The stuff you get to put on spaghetti? If you are talking about the shaker her stuff then no. If you are asking about shredded parmesan out of the dairy cooler then yes. I line a cookie sheet with foil, put cooling racks in the pan, put bacon strips on the racks being careful not to crowd and bake at 300 degrees F., until desired crispness. You have to keep the bacon out of the fat. Save the fat for fatbombs. I made these with real white American cheese slices. And with slices smoked Gouda. The Gouda didn’t puff up but was crunchier. Both are very good. My first two batches never really crisped so I put back in the oven later and browned up more that worked. I love these! I tried it with cheddar that I shredded myself but they were so oily that they never got crispy. Works much better with preshredded cheese because of the drying agent they use to keep it from clumping. Made these on Sunday and love them. I made with cheddar and coby jack cheese slices. They were crispy last night after making them, then I stored them in a ziplock baggie and the turned a little soft. Any suggestions on storage? The next day I just popped them in the microwave for about 20 seconds and they were crispy and even better! Dawn: The best way to keep these crisp is to make sure they are open to the air. A plastic bag will make them soggy. What I do is put a coffee filter in the bottom of a large bowl, place the crips on top of the coffee filter (AFTER they have completely cooled), and then place another coffee filter on top of the crips. That keeps the dust particles out but does not keep in the moisture. I just keep this on top of my countertop. The crisps are gone long before they could possible spoil. How many of these should you eat in a sitting? exactly! about to make some now. I do not have parchment paper and I make these perfectly with my TRULY NON STICK frying pan. no oil needed,just cheese… comes off and frying pan clean as if never used (truly non stick I say) and a billion is right! yes, i know a lot of people do them on the stove in a nonstick pan. i haven’t done that before since i’m always making a pretty large quantity at once, but i know it can be done. some people use the microwave as well! If you’re wondering about calorie count, just figure it out by the amount of cheese you start with. Parmesan has 122 calories per ounce. Say 1 ounce of cheese yields 12 crisps. Eating 4 of them would be 1/3 ounce of cheese, or about 40 calories. Sounds delicious! Would it work on a Silpat mat? I have NO idea why, but they always taste kind of weird when I make them on those… regular parchment is the way to go for these. Did not work. The cheese stuck to the parchment paper. did you accidentally use wax paper? they are NOT the same. I’ve NEVER had them stick to parchment. When she says use a teaspoon, USE A TEASPOON!!! I tried bigger and they weren’t as crisp and yummy!! TEASPOON ALL THE WAY!!! I absolutely love these! They are very addictive! I did find that Reynolds foil with the non-stick baking side works just fine as well. I am experimenting with lots of seasonings and haven’t been disappointed yet! Thanks for the great recipe! That sounds like a great recipe EXCEPT for the waxed paper. And now you know better than to second-guess me. hehe. Sounds wonderful! Thanks for sharing your recipe with us at Merry Monday. What a perfect little snack! These look so delicious! I will definitely have to try. Have you ever made them with parmesan? i haven’t but i know it will work. 🙂 I’ve had “parmesan crisps” at restaurants on salads and stuff! Used Parmesan with thyme and black pepper. OMG salty crunchy and delicious. These sound amazing! I can’t wait to try. They would be great for party snacks and I love that you’ve offered a few seasoning ideas. These look awesome- I’ve been the worst with me eating lately, but I need to make a plan for after this baby comes. These will definitely be a part of it for when I get those cravings for savory snacks! I absolutely love this recipe. I found it on Pinterest and tried it of course. I made it in a pan on the stove, which also worked quite well. I liked it so much I had to put it my blog as well. Can I make these in advance of a party? How long will they keep in a ziplock bag? Had to try another cheese, this time I used pieces of cut up blue cheese slices I bought from GFS, and sprinkled with some garlic powder. They took a little longer to cook, they are AWESOME!!! Just made these with cut up swiss cheese slices tossed with cayenne…yummy and gone!! oh this sounds like a great combo! thanks for sharing. Hey! I just wanted to say that I’ve tried this with provolone and mozzarella. Provolone works well even though it’s not my favorite. Mozzarella turns into this cheese puff thing. It’s good but if you crunch, then you don’t want mozzarella! Omg soooo good! I did it with Walmart brand fiesta blend and used the new non-stick foil (couldn’t find parchment) and it worked great! Thanks so much for posting this! I was diagnosed with Insulin Resistance and have to be on a low carb diet, I was getting bored but now with these “chips” I’ll be good to go!!! I read this and made them immediately. I used shredded mexican cheese and sprinkled with jalapeno seasoning (popcorn). Just baked 6 minutes and they were delish! Thanks for the great ideas. Wonderful! I’m so glad you enjoyed them. The jalapeno flavor sounds GREAT. These are perfect. I have one question. I am looking for a low-carb snack I can make to take with me when I travel…something that does not require refrigeration. Will these chips keep without being refrigerated? Thank you. I’ve eaten them a couple of days after making them, and they were fine… they do get a little less crispy sometimes… but I actually prefer to leave them out vs refrigerating them. But I wouldn’t eat them for like a week or something… just, personally. I made some of the cheese snacks last night and everyone loved them. My question is, how do you store the left overs? I put them in the fridge last night and they have good flavor but they are not as crisp? I was concerned about leaving the chips out. Does anyone know if it would be possible to make a large batch of these ahead of time and store them in a bag or container? Or will they spoil or get chewy if you store them? Christy, When I make them, once they are cool, I put them in a ziplock bag and leave them on the counter. They stay crisp and fresh tasting. I’ve let them sit as long as two weeks, but I always eat them all by then, so don’t know if they will last longer. Awesomely tasty. I tried this with parmesan cheese, pecorino romano and queso fresco. The parmesan turned out slightly chewy and awesome. Pecorino romano turned out more lacy and crunch-y, and queso fresco apparently doesn’t have enough fat in it to melt. I got little piles of slightly brown dusty sadness. I was trying to figure out what to do with multiple bits of leftover cheese before they went bad. Tried these cheese crisps and they were great! I didn’t read all of the comments so I may be repeating what other tips were sent your way. I tried the Pepper/Jack and Ranch dressing mix. I didn’t have the dressing but did have the dip mix… really tasty! Instead of dropping them by teaspoonful’s, I spread a thin layer over the parchment and used a pizza cutter to cut them when they were dome and cooled. Thanks for sharing your recipes with us Emily. Seriously people, if you havnt tried these yet DO IT NOW. On that note I didnt use parchment. I used a well seasoned baking stone. And FOLLOW the 1tsp recommendation. They spread. Too much is chewy. Hubby says they remind him of potato chips. My 2% mexican blend puffed up. Yummo. My gouda was delish, as was the pepperjack. Now to see how to store these as I made quite a few. I dipped some in a spinach artichoke parmesean dip I just bought from Costco. 2 carbs/2TBS. Heavenly. Aw thanks for letting me know! Took a look at your post and it looks great. Love your use of the waffle iron for your grilled cheese, too! These are AWESOME. I used the Sargento ultra thin pepper jack and it worked out beautifully. I made some grated cheddar with garlic powder. I also made some Sargento ultra thin cheddar slices with a sprinkle of taco seasoning. (These were also awesome.) Finally. A crunchy snack food I can eat with meals or have as a stand alone snack. CAN U USE CRUMBLED FETA OR CRUMBLED GOAT? tHANK U VERY MUCH AHEAD OF TIME 4 REPLY. I’ve made them with the Sargento unltra thins, too, and they make great one’s. I just folded each slice in half both directions and ended up with 4 small rectangles that turn in to crunchy medium sized rectangles when they’re finished. I always make a ton when I do make them… they are gone SO quickly. Everyone in my family loves them too. 🙂 Chili garlic flavor sounds great. Made made a couple varieties…cheese makes a difference. Still all really good, just nuke a bit more or less. I added some salami bits to the cheese, really good. I also added some pepper cheese to some Colby shredded cheese also really good. My advice play…seems that all are good. If you are eating Atkins. A great snack. the salami bits is a great idea! I’ll be trying that next time. 🙂 I still make these crisps ALL the time, and my kids love them too. Are you sure you used parchment? It sounds like you used waxed paper which is totally different… that would burn and stink, and the cheese would definitely stick to that. So happy to hear it! You’re very welcome. Very tasty! I made 16 little piles in one pan then placed 16 pepperoni slices on a paper towel in another pan. Cooked both for 7 minutes. Both were crisp and tasted great together. I was eager to try this recipe and didn’t have the parchment paper so I tried them on a cookie sheet sprayed with Pam and they came out perfectly. I let them cool and then lifted them with a pie server and they didn’t fall apart. Thanks for the recipe, delish!!! These are incredible!! And they’re fantastic with homemade pesto! Amazing! Absolutely Fantastic! But now, what do I do with the leftovers? Can I just leave it out in a well-sealed container or do I need to refrigerate it? How long will it stay crisp? So I ran to the store and got the ranch packet and made them. Maybe I did something wrong but those are SO salty and I can’t stand them. AWFUL!!!! What did I do wrong? This is SO disappointing!!!! You just need a very small amount of the powder… Not the entire packet. I’m guessing you dumped it all in? Great…I just now scrolled down to read that you meant the powdered Ranch packet!!! UGGGG. I made it with dressing and they are SO runny!!! It’s after 9 and I am needing a late night snack. It would have helped to know this to start with. Or, you could read the directions carefully, noting that it specifically states “ranch dressing mix” and not a whole freakin’ packet of actual liquid ranch dressing. Do you even physics? LOVE this recipe! I’ve been using it for a year now, and it never disappoints. Actually, your whole blog is a wonderful resource for grain free baking. I just made some of these today and posted about it on my new food blog, http://www.gethungrynerds.wordpress.com, if you’re interested in having a look. What is parchment paper and where do you buy it? It’s a type of paper you can use in the oven. You should be able to find it in your local grocery store. I mixed 1/3 cup shredded Mexican blend cheese with 1/4 tsp. each chili powder, dried cilantro, and garlic powder then baked as instructed. Pretty dag gone tasty. I need to start them a little thinner before baking so they get a little crispier and I think I will go with 1/4 plus 1/8 tsp. of the chili powder and only 1/8 tsp. of the garlic, but even so. Yum. I’ve been looking for a low-carb alternative to chips and crackers and I think I have found it. I am so totally going to try this with cheddar cheese and crumbled bacon! I should add that my mix yielded 11 “chips” though I am going to stretch it next time for an even 12. My guess is that the chips shown were made with spread out Cheddar Cheese. That made the tiny “holes,” as you called them. I have been eating these for years.. but only when I was baking something with cheese on it.. and it spilled onto the pan. I never thought about using them for a cracker! Great idea. BTW.. In my family we call it “Cheese Paper,” and we usually fight over it! Well, this is the second recipe I’ve found on your site in less than a week. Seems like I need to follow your blog or subscribe to the feed or whatever the proper lingo is. Also wanted to mention if you have a silpat, you don’t need the parchment paper. No kidding. I used to sell them, but now you can get them in any top quality kitchen store (Sur La Tab, Williams & Sonoma, etc.). 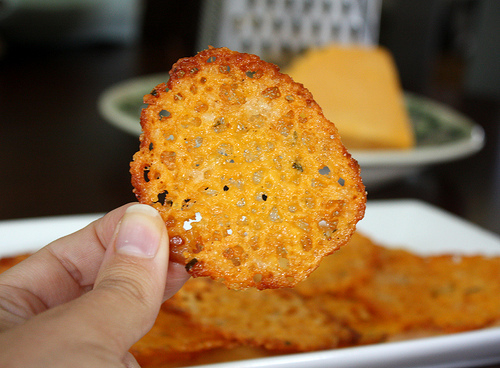 Perfect for cheese crips–I promise! Attractive component to content. I simply stumbled upon your site and in accession capital to say that I acquire actually loved account your blog posts. Anyway I will be subscribing for your feeds or even I success you get entry to constantly quickly. Let me get it straight – that’s ‘Ranch Dressing Mix’ right? The powdery stuff – not the liquid ranch dressing. Was your comment for another of Joy’s blogs, you know about Ranch dressing powder, or have I missed something? Or can you sprinkle the powder on the cheese crisps? Thank you so much for this recipe! Even a picky, pre-career twenty something idiot like myself could make these easily! I just made these using pre-sliced cheddar cheese and sprinkling some sesame seeds on top midway through the cooking process. So yummy! These cheese crisps look amazing! But what else is added? Shredded cheese and what? What holds it all together? Shredded cheese and ranch dressing? That’s all I was able to get from this. I love the picture of the crisps with the little holes in it — you can just imagine how crunchy they are. I’m cooking for my granddaughter who is on the Atkins diet, and I’m always looking for something new for her. Please tell me what I’m missing! I can’t wait to make these. Nothing else is needed! If you cook it until slightly brown on the edges, the cheese holds itself together after it cools. Awesome!! But…. better still, at least for the lazy man. Spread a thin layer of grated cheese on your cookie sheet with parchment paper, little or no parchment paper showing through, cook as directed here, then cut into ~2×2 squares with a pizza cutter before they cool. Less work, less fuss, no worrying about ‘running together’, more ‘chips’ per effort. Try it!! My husband has made these for years with Monterey Jack cheese, sprinkled with cayenne pepper, yum! He makes them in the oven on foil covered cookie sheets. Anyone know how to make these heathier like with veggies??? I’ve done this dozens of times and it’s very easy, although it takes practice. Take a non-stick frying pan and lay about 3 slices of any cheese you want. Turn on medium heat and let the cheese simmer. Allow the cheese to keep simmering and you will see the edges start to turn brown. Tilt the pan a little and if cheese flows, it needs more time. Once the cheese doesn’t flow when you tilt the pan, take it off the fire and in the tilted position, pour the oil (saturated animal fat) into a receptacle. I typically can remove 1-2 Tbsp of oil from 2-3 thin slices of cheese! It’s eye-opening. After removing the oil, flip the cheese with a spatula to cook any uncooked cheese, and remove and place on a paper towel to remove any leftover oil. Season with salt or seasonings and enjoy your carb and fat-free CRUNCHY snack! Let me know how it goes! Enjoy!!! Why on earth would you want something to be fat-free? I just put mine on a paper towel as soon as they were firm enough to pick up. Microwave Alternative!! I’ve done this many times. You MUST use 2% cheese. The whole % is too fatty to crisp. I use the block cheese. Cut it sandwich slice thin, break slices in half, into about 3/4 inch squares, put on parchment paper as already instructed. Even if they spread together, they are easy to break apart. I put the parchment paper directly on the microwave turn table. (EASY cleanup) Microwave on high for 1 minute 30 seconds. Wafers come out round and crispy when cool. Much faster than the oven method. Wafers are a great low-carb alternative to crackers. I use them with hummus….yum!! Yes it is true that if the cheese is too fatty, it won’t crisp up. I, too, have always used the microwave, which is must faster than the oven. These are addicting! Microwaves are toxic and make the food toxic. Please do research it and stop using the microwave. Perhaps microwaves are toxic. Perhaps so is processed cheese. I’m pretty sure the 20% extra body weight most Americans carry is toxic. I’m going to chance the microwave. Please provide proof of your claim that Microwaves are TOXIC. Personally I think your claim is BS, but I thought it would be only right to allow you the chance to back your BS up with some FACTS. with the sesame seeds… which makes it even better!! I add roasted sesame seeds as well and it tastes delicious! I did this tonight with sliced cheese. I used my Pampered Chef stone. I sprayed it to make sure they didn’t stick and I don’t think I need to worry next time, there is enough in the cheese I think. Anyway, I did have to cook it about 10 min but they turned out great. Thanks for the ideas. I’d never considered adding seasoning to a cheese crisp! So funny! I also call it a spatula, or a flippy doodle. OK, flippy doodle is the best thing i’ve read all day. Excellent publish, very informative. I ponder why the other experts of this sector do not realize this. You should proceed your writing. I’m confident, you’ve a huge readers’ base already!|What’s Happening i’m new to this, I stumbled upon this I have discovered It positively useful and it has helped me out loads. I am hoping to contribute & assist different users like its aided me. Great job. How long will these keep and if so how do you store. the cheese crisp recipe is excellent;HOWEVER, you didn’t indicate not to use fat free cheese. the crisps don’t crisp with it. i made “rubber crisps” when i tried it with fat free american cheese. otherwise, since that faux pax, my future crisps were crispy crisps!! So simple, I can’t believe I never thought of it! I’m eating these at lunch with my toddler. It’s so nice to see her eating something other than crackers! More in the oven and I can’t wait til they’re done. Thanks! I made these last night with shredded cheddar. Absolutely fantastic! I’m thinking I can make a batch of these every time I turn the oven on so I can eat them while I am making dinner! Is the cracker home made as well. Sorry for the dumb question. I love this idea. I’m gonna try it today. How do I go about getting on some kind of automatic email list or something of the sought? I would love to get these kind of recipes regularly without actively searching for them. I’m new to low carb and looking for some new and tasty ideas to keep me from returning to my old habits. I would love to get emails from you with the different low carb recipes. Any low sodium recipes would be good to. Thank you! I really like these cheese crisps! I have a question, if you’ve got any leftover, do you store them in the refrigerator or just in the cupboard? tried this with pampered chef sour cream and salsa seasoning – great! I made these years ago, but never thought of adding seasoning. Very interesting! Thanks for reviving a lost pleasure! Thank you! thank you! thank you! I’m a border line diabetic and I find that if I stay low carb I can keep my blood sugar under control. I was sitting here craving something crunchy so I googled low carb snacks and WOW! 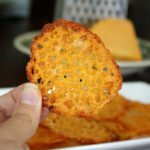 these cheese crisps are so easy and tasty. I think I love you! WOW! You are my new favorite person 🙂 I found this link on the MDA forums and I think you single-handedly cured my cravings for chips and crackers! I made these with half regular cheddar and half Irish aged cheddar and then added garlic powder and cayenne pepper and had to stop myself from eating the entire tray. Thank you!!!! Just made these..sprinkled in some mrs dash garlic and herb. Going to make these along with the artichoke dip for New Years tomorrow evening. 🙂 Thanks for sharing!!! I’m new to your blog. I found you when I was entering the BlogHer promotion. Am I right to assume that your hubby graduated from the Naval Academy? I grew up near there. I’m anxious to try the baked cheese crisp recipe. I’m also interested in the Paleo diet. My chiropractor swears by it. I look forward to dropping by again. I like your blog. No, he went to Virginia Tech. 🙂 I hope you like the cheese crisps! Definitely look into Paleo but don’t just go by Cordain – he’s afraid of animal-derived fats, and shouldn’t be. Do your research! These also make excellent mini taco “shells”. You can top them with low carb favorites such as salsa, seasoned ground meat or chicken, sour cream and a bit of guacamole! I made them today with cheddar cheese and Mrs Dash Original Blend spice. They were delicious. I liked them so much that I made them twice, about two hours apart. The first time I took them out of the oven sooner than the second time because I was afraid they would burn. I liked them both times. You are right that if you take them out before they turn brown on the edges they taste more like melted cheese than like crisps. I am in love with your Exciting Swiss Chard (or spinach) recipe and have made it twice – everyone ohhhh and ahhhhd over it. Got more Swiss Chard in my CSA basket this week and plan to make it again tonight. Great website! I mixed together 2% Milk – 4 Cheese Mexican Blend, garlic powder, oregano, and paprika. Then, I carefully placed 1 tsp “mounds” of the mixture on a cookie sheet, covered w/wax paper and sprayed w/olive oil spray. Before putting them in the oven, I sprinkled a pinch of Parmesan & Romano Cheese Blend on top of each crisp. Then, I baked them for approximately 7-8 minutes, at 350 degrees. Per your suggestion, I slid the wax paper off the baking sheet and onto the countertop (we have concrete counters, so they are nice and cool), which worked great for cooling. These are fantastic and paired nicely w/my soup! I only had tillamook swiss slices. I wasn't sure if swiss would work or not, but thought it was worth a try. It worked and was very good, but it took about 15 minutes before it was crisp and it never really browned. I suppose it is a high moisture cheese. But, we were pleased and thought it was delicious. We eat swiss because it is lower in sodium. My husband has high blood pressure and low salt is a must. Each slice has only 60mg of sodium and 8 grams of fat. I cut each slice into 16 pieces. Thanks for the recipe. I am a newbie on blogging, but I just ran across this recipe in my low-carb searches and I just had to try them. I made 3 different variations. My favorite was, grated fresh mozzarella and parmesan with dried basil and garlic powder. These “spread” even more than the other cheeses. I finely chopped a tomato, added some black pepper, kosher salt, and a splash of olive oil and used my “cracker” to scoop up that tomato…..absolutely delish. Wow, those sound amazing! I did shredded part-skim mozzarella with red pepper flakes and oregano, and they were great, but now I have to try yours!! A Silicone bakeware mat or pan works great. (Remember smartware?) The cheese releases easily. Also cheese with less fat has less holes and puffs up. Thanks for the tip. I should have read it more carefully. =p haha I will definitely try this again. I've done these with Parmesan for salad garnish and used a Silpat. Worked great! honestly, i have no idea because no matter how many i make they're all gone within a day or two. haha. I’m making these as I type. Thanks for the (I’m sure) scrumptious recipe! For how long will these keep fresh? I am planning to make some, but not sure how many to make if they don't stay fresh for a few days (who am I kidding, they'll be gone in a day…haha. BUT, just in case!) Thank you! WHOA what is non-stick foil??? I have never seen this! AWESOME and thanks for sharing. If you happen to not have any parchment paper, like myself, and also happen to own a cast-iron skillet, it works perfect! Gives a good flavor too! FWIW, foil does work, IF it's NON-STICK foil. Just tried these. OMG so good! Thank you so much for sharing! I'm glad to see that other people eat them and I wasn't actually being 'naughty'! Sounds great! Hope your party guests love them. haha that author must've been a vegetarian TOO LONG… I don't think in a million years that crisp provolone would taste like bacon. But I bet it's awesome. Every other kind of cheese I've tried has been! And provolone is great anyway. mmm. No you can't! A paper grocery sack is just paper… parchment paper is coated/soaked with silicone so that it can withstand high temps and becomes a non-stick surface. If you have one of those “silpat” type baking sheets that would probably work great! Can you use a paper grocery sack if you don't have parchment paper? Otherwise, I'm going to have to run to the store ASAP to get some parchment paper… These sound “to die for”! I saw this a zillion years ago in a vegetarian cookbook using provolone. The author likened the taste to bacon. We used to make these when I was working in a small restaurant for us to snack on. 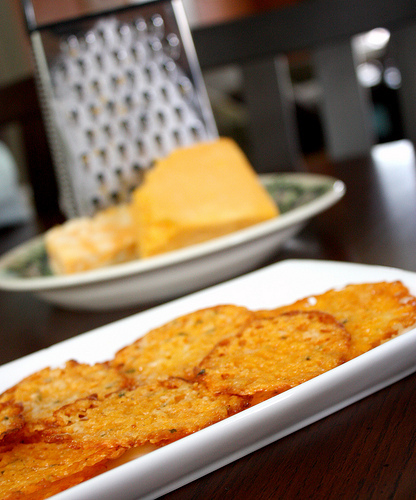 We called them just that – Cheese crisps. They are so yummy – maybe I'll make them for our next party. Wow, what a neat idea! Sounds delicious. I make these using parmesan sprinkled with some chopped pistachios and dried cranberries. So yummy! I know, right??? How can this be bad? Excellent! I hope you make them soon & LOVE them as much as I do. The crunchy bits of cheese that fall out of my grilled cheese sandwhiches are ALWAYS my favorite. Mmmmm. hahhahahaha my mom fake-cursed on my blog! except i never just want one or two. haha. Waxed paper isn't made to withstand high temperatures the way parchment paper is… so I wouldn't. But you can try it and let me know, if you want. You can also do this in the microwave w/ waxed paper. I think it takes about 20 seconds in microwave. Perfect for when you want just one or two. That would definitely be great! Much better than the “questionable oils” and whatnot.